Well it’s been a long time coming but the brand new Porsche Carrera Cup Car has finally landed in Australia. As part of the official launch, Porsche Cars Australia invited McElrea Racing to Sydney Motorsport Park along with the other Carrera Cup teams for 3 days of technical training and a day of private testing. With MR set to be the only four car team the entire crew was in attendance including our N2C ‘works driver’, the legendary Warren Luff. To find out how the new car compares to the previous model we asked Luffy to give us his first impressions of this exciting new car. Luffy, for those of us who haven’t seen the new car in the flesh, what are your first impressions..? Mate, it’s just awesome. 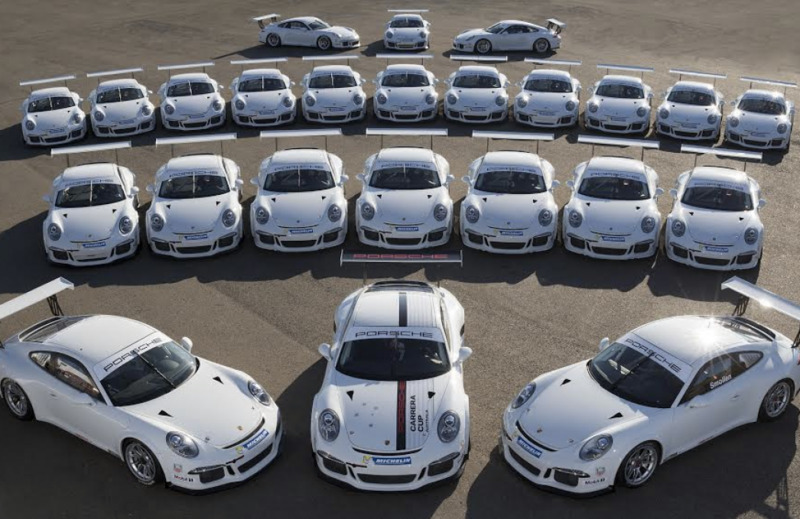 It’s the natural progression that we have come to expect from Porsche, it’s truly a testament to them. It looks amazing, it’s wider and longer with a much more aggressive stance and most importantly it’s faster… much faster. So tell us about the drive, what’s it like…? Well the first thing you notice is it feels much more stable and planted, particularly at high speed. This is due to the wider track, longer wheelbase, additional down force and bigger tyres. The most significant change for the driver is the addition of the paddle shift gearbox. It allows you to really focus on the job at hand ensuring much better (steering) control on entry and exit to corners. The paddles have a really positive feel and Porsche have obviously invested allot of time and effort in making the system work as well as it does. What about the engine, do they sound any different? What are your thoughts on the 2014 Australian Carrera Cup Season? Well the best (and worst) thing about the new season is everyone is once again on a level playing field. It means any advantage you had with setup on the cars is gone. That being said MR are the ‘best in the business’ so we are guaranteed to be fast from the outset. We will also be collecting data for five cars which should speed up our development time. In terms of speed, everyone will be faster but the challenge will be the same as always… to be one of the ones finding that extra tiny bit of performance, that ‘competitive edge’, that will be the secret with the new car.